Lyft waged an expensive war against Uber that enabled the upstart to steal market share and rapidly grow revenue. But Lyft is losing gobs of money — and it’s unlikely to turn a profit any time soon. The No. 2 US ridesharing service lost nearly $1 billion in 2018. Lyft has lost money each year since its founding in 2012. Lyft, which is seeking a valuation of up to $23 billion in next week’s IPO, isn’t expected to break even until 2022, according to an analysis released on Monday by Morningstar and PitchBook. Lyft won’t generate a meaningful profit until 2023, the report predicted. “It takes a long time to dig yourself out of a $1 billion hole,” said Nicholas Colas, co-founder of DataTrek Research. Lyft’s IPO filing shows meaningful progress in its battle against Uber. The smaller company claimed 39% of the US ridesharing market at the end of 2018, up from 22% two years earlier. Equally impressive, Lyft’s revenue more than doubled to $2.2 billion last year. But those gains came at a significant cost. Lyft is losing about $11.50 for every $100 of customer billings, twice the rate of losses at Uber, according to Renaissance Capital. Lyft posted a loss of $911.3 million last year, 33% more than in 2017. Lyft pointed to rising expenses as it develops and launches new offerings and features, expands in existing and new markets and increases marketing efforts. Of course, Lyft isn’t alone in the red. Rival Uber reported a loss of $1.8 billion in 2018, although that was an improvement from the year before. The IPO filing didn’t even attempt to paint a picture of how and when Lyft will venture into the black. “There’s nothing in that document that points to a pathway to profitability. There’s none of that,” said Colas. But in some ways that makes sense. Even though Uber and Lyft are mainstays in most American cities, ridesharing is still a relatively new concept outside of urban areas. It will take Lyft time to scale up to a point where it’s reliably profitable. Lyft’s ability to rack up large losses while rapidly growing its revenue is a byproduct of the ocean of money swimming in Silicon Valley. Venture capital firms have patiently subsidized Lyft and dozens of other startups as they mature. “It’s emblematic of what’s happened in private markets,” said Phil Haslett, co-founder of EquityZen, a secondary marketplace for pre-IPO transactions. Lyft raised a total of $5 billion through 11 rounds of funding, according to PitchBook. Wall Street, on the other hand, is hardly known for its patience. Investors are laser-focused on quarter-to-quarter growth. “Lyft’s numbers show this company couldn’t have gone public any sooner. It needed to be shepherded through a process that didn’t require hitting quarterly numbers,” said Colas. Investors may be willing to overlook Lyft’s projected losses — if management can convince Wall Street that it’s on the right path. The addressable market, including taxes, ride-sharing, bikes and scooters, is expected to grow to more than $500 billion in gross revenue by 2023, according to Morningstar and PitchBook. 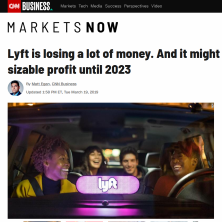 The report predicts that Lyft will generate compound annual revenue growth of 36% through 2028 to more than $21 billion. And Lyft could easily point to other money-losing tech companies that went on to great success. Amazon (AMZN), for instance, lost money each of its first full five years as a public company. Today, Amazon is valued at $850 billion and its founder Jeff Bezos is the richest person in the world. “That’s clearly the happy case about what can go right here,” said Haslett. Investors are going to evaluate Lyft on a range of other metrics, including number of users and revenue per user, to see if it’s on the right track. Lyft even came up with its own statistic: a metric called “contribution” that paints a much rosier picture of the company’s finances. Lyft’s IPO filing says this is a “key measure” of the company’s “ability to achieve profitability and increase it over time.” Contribution is defined as revenue minus the cost of revenue — excluding certain costs such as stock-based compensation and the amortization. Investors would be wise to take novel metrics with a grain of salt and instead focus on the big picture. Colas compared buying Lyft today with owning stock in a railroad company in the 1880s, when they were losing money from building thousands of miles of rail. Eventually, those railroad companies went on to make a lot of money.